So you know when it’s Christmas? And you’re getting all excited about christmas? You are so going christmas shopping, you make christmassy things, you get to wrap up presents…. and then there’s the christmas food. Amirite? Like seriously, SERIOUSLY, the food. I’m not even talking about actual legitimate Christmas food (mince pies, gingerbread, candy canes, advent calendar chocolates), but just ALL FOOD. For some reason, when it’s around Christmas time (who am I kidding) as soon as the calendar flips to December 1st, somehow, all food becomes okay to eat in copious amounts because “it’s Christmas”…. Okay I don’t actually know if anyone else experiences this random Christmas eating excuse, but I certainly do. I also use it as a baking excuse, to just constantly replenish the ‘diminished’ cookie supply…..
Now we all know how hard it is to say no to free baked goods, or just not bake before the ‘big day’ (Crimbo itself) when you know you’ll be eating loads of awesome food ALL DAY. and what’s easier than saying no? saying yes. 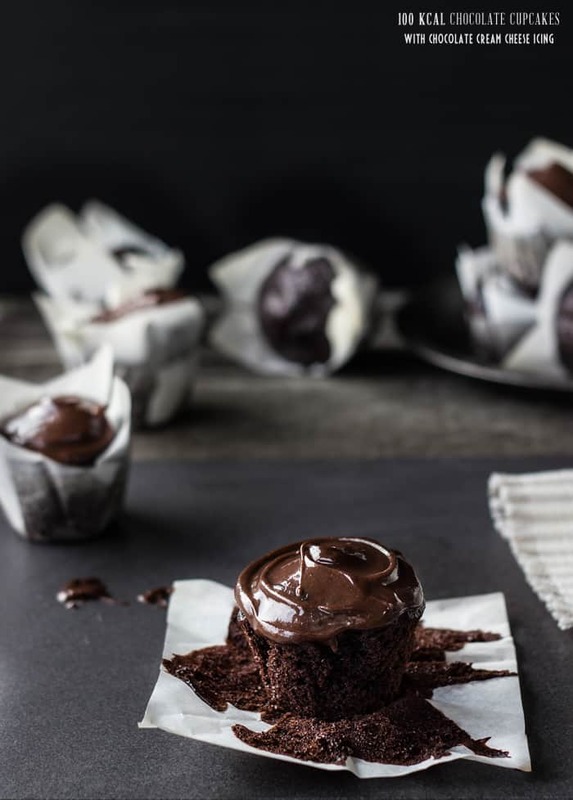 Saying yes to a delicious, moist chocolate cupcake. I also found that I had to squeeze as much water as possible out of the grated carrot (added for bulk, moisture, fibre, vitamins and sweetness!) to make the cupcakes work – so don’t skip that step! I hope everyone has an awesome run up to the holidays! Preheat your oven to 350 degrees F (180 degrees C). Put the finely grated carrot into a fine mesh strainer. Hold the strainer over a sink and squeeze the grated carrot to remove as much liquid as possible. Place into a medium bowl. To the bowl, add the melted oil, egg and yogurt/buttermilk and stir in. Add the next 6 ingredients (flour through to cocoa powder) and stir in. Lastly, stir in the hot water until just combined. 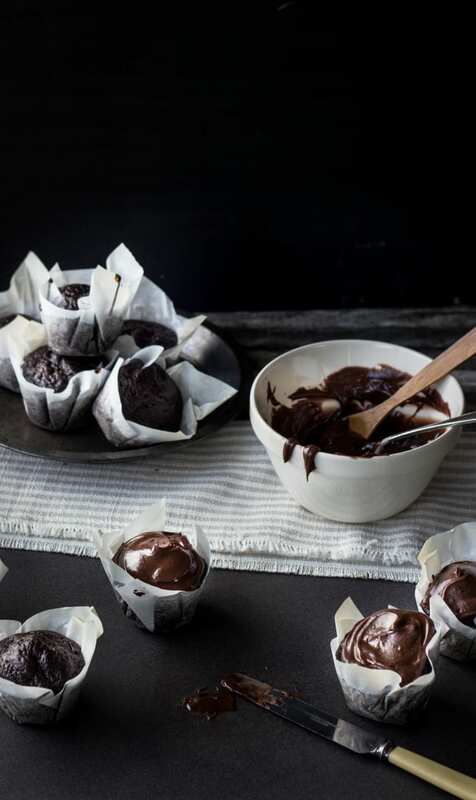 Divide the batter between 12 lined muffin cups. Bake for 20 minutes (or until a toothpick comes out clean). Cool on a wire rack. For the frosting, combine all the ingredients in a small bowl until smooth. Use about 2 tsp to frost each cupcake. 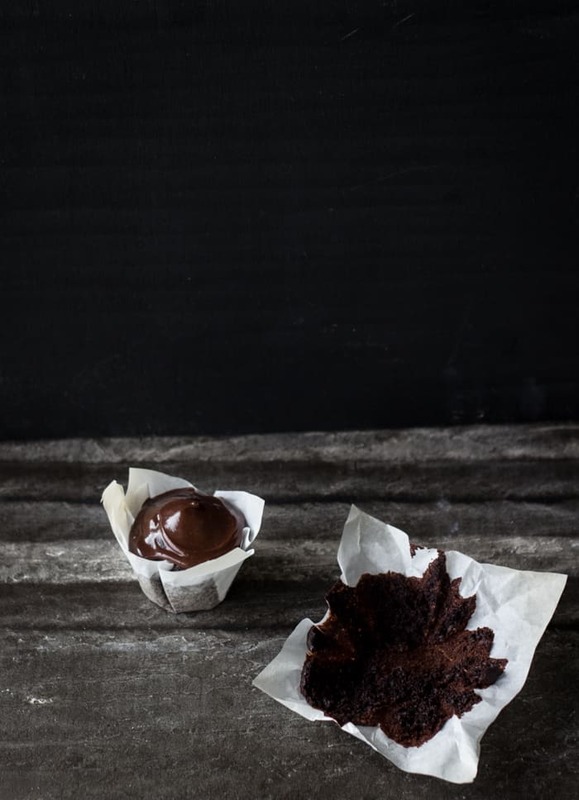 Do you always use just square pieces of parchment paper to line your cupcake tins? I love that idea. Can’t wait to try this recipe. The cake looks very moist. I think I’ve only ever used parchment paper twice before for lining the muffin tins; I don’t know why I don’t do it more often, I find it so cute! It’s also useful if you have a weirdly sized muffin pan that the liners don’t fit properly 🙂 Thank you!! ooooo – I am all for these! I fall into the holiday eating trap! Oh well! At least these will give me an excuse to eat two instead of 1! These look so lovely!!! And I love your low-calorie option, totally perfect for the holidays when overindulgence is everywhere. They don’t look low-calorie at all!! OMG I LOVE YOUR BLOG! I just found you through Spoon Fork Bacon and I must say you are the epitome of exactly what I strive for style-wise in my baking and photography. I’m so glad I found you, can’t wait to see what other treats you have in store! Yes, I need food help like this. Especially since I just ate a chocolate-covered macaroon that was the size of my fist. Theses are so good! I found you through foodgawker and pined your awesome recipe, this is just what I needed! Great looking recipe, might try making these somewhere these upcoming weeks. 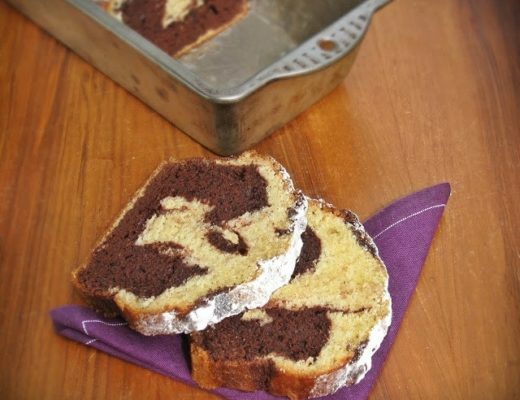 Usually, I’m really sceptical about low cal recipes for great desserts, but hey, this one looks genuinly good. Now I just need to find myself some coconut oil. Can you substitute coconut oil? yup! you can sub in the same amount of any neutral oil, or even butter if you want! These look soooo so good. I love that you added carrots and yogurt to them. Such a great idea. I want this to GET IN MAH BELLY too!! lovely. lovely photos! These look so delicious! I am also OBSESSED with coconut oil at the moment, I just ordered two HUGE jars online. What is the difference of coconut oil and ofter oils? Does it tasts like coconut? How is the consitency,ect? I would love to know, because I have never justed it yet! Ugh, I’ve been totally eating cookies like it was a food group this last month. So yeah, these cupcakes may be the perfect solution. These look awesome, Izy! AHAHA totally, you just summarised my December completely in that first sentence :’) Thank you! wow..I really love how do you work with food and the way you fix it on images..keep it!! Hi, do you use mini muffin tins or the normal sized tins? Can you substitute greek yogurt for the lowfat regular? I’m assuming it will be fine but thought I’d ask! Damn it, I want one of these. Badly. Despite the fact that the holidays are over, my body still craves all of the chocolate, cookies, and really ALL THE FOOD. I love the idea of cupcakes that come with a little less guilt! In the frosting, is it really just 1 1/2 TBS of cream cheese? I’m trying to make these now and it’s just a very powdery mix at the moment…. HELP! I made these today and they were awesome! The cake was moist and delicious and I would have never known there was carrot in the list of ingredients nor a mere 120 calories per cupcake! I used 1/c cup cake flour and 1/2 cup white whole wheat flour, buttermilk, Callebaut dutched cocoa, and added 1/2 tsp vanilla extract. The frosting was a bit difficult to work with so I added 1 tsp buttermilk, and 1/2 tsp vanilla extract. 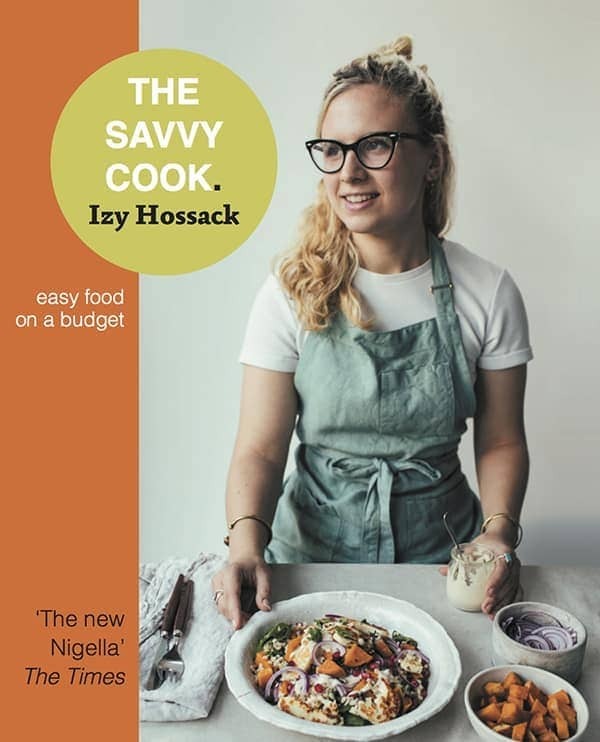 Izy, I have been following your blog for a few years now, and your recipes are brilliant, particularly the healthier recipes. Keep em coming girl! Thanks Yomi! I’m glad you liked them 🙂 I love that you used whole wheat flour, I’ll add that to the notes! The reason the frosting can be difficult I think is because of the low fat cream cheese – sometimes it makes frosting really wet so you don’t have to add any liquid, sometimes it’s too dry; I think it depends on the brands… Anyways, thank you for reading my blog for some time, I’m always excited to hear from long time readers! Made these today for a friend’s birthday! They are WONDERFUL. so moist! I was a little skeptical to make the cream cheese frosting at first, but then I made it and it was a great decision. I LOVE the frosting. I’ve been reading your blog for only about two weeks but I am so hooked. Your photography is amazing and the food is delicious. Thanks for the recipe! Definitely going to keep it around for sure. 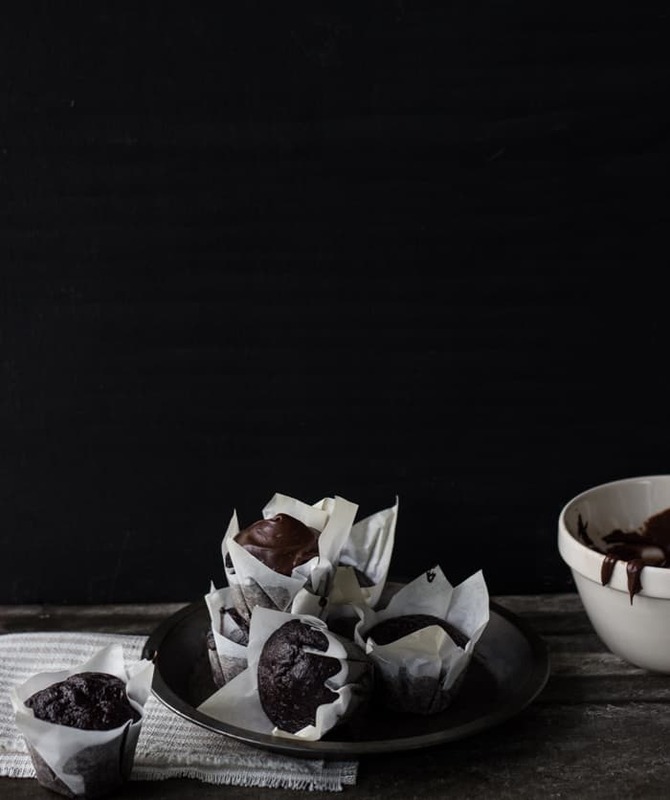 Hi Izy – These cupcakes look fabulous & I’m definitely going to give this recipe a whirl. In fact, I’ve only just stumbled across your blog and it’s really great, so there’s a lot I’ll be trying. Looking forward to many more 100Calorie recipes 😀 *hint* I’m nurturing my sweet-tooth despite my general Eat Clean philosophy! Advice please: If I wanted to reduce the sugar quantity in this recipe to, let’s say, 1/4 Cup instead of 1/2 and use Stevia to make up the rest of the sweetness, would that drastically affect the texture of the sponge? Hello Izy, I’m excited to give these cupcakes a try. What is the best way to store these? Have you experimented in how much in advance these can be made? I bake for friends and family and sometimes I have such a large order, I’m wondering if these can be made in advance. Thank you so much for sharing!!!! Thank you, Izy! I really appreciate that. Room temperature, I assume? Can you share if i want to make 100 pieces if it? Can i replace coconut oil with coconut milk/cream? you can replace the coconut oil with an equal amount of any neutral vegetable oil. Coconut milk and cream are completely different to coconut oil. You should substitute sugar for apple sauce or something, and you can decrease it by a large amount of calories. Hi, I’m thinking of making these for the Superbowl but I have a question. If I make them without the carrots and yogurt will they still taste good. Also, would I be able to use vanilla extract instead of cocoa powder or would it ruin the recipe. please answer ASAP. Sorry for commenting twice but one more thing. If I do this will it still be low fat and if I put the carrots in would I be able to taste them. This is an amazing recipe. I just made these for a friends birthday and no one noticed the difference (other than those I told and even then they were a hit!) However, they fell like a soufflé when I took them out of the oven. Just wondering if there’s a way to avoid that from happening as I will probably use this recipe for all kinds of cakes. Do these need to be stored in the fridge because of the carrot/yogurt in them? I made these cupcakes this morning and they were SO good – wonderfully soft decadent, & no one guessed they had carrots in them! I used whole wheat pastry flour & organic coconut sugar, and subbed plain yogurt for the cream cheese in the icing. Thank you so much for the recipe! It’s definitely a keeper. I saw this recipe a couple years ago but finally made it. 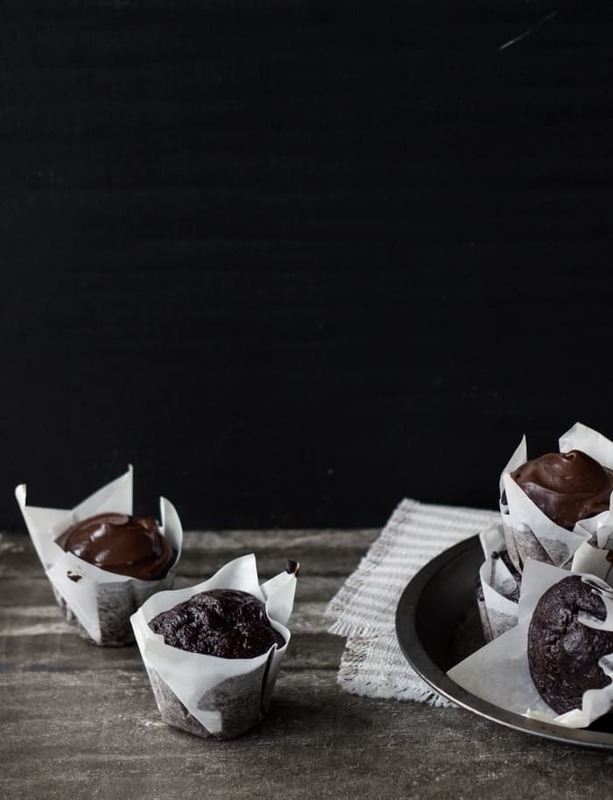 These are SO good….they taste like rich chocolate cupcakes. Unbelievable. Now: how to keep myself from making these every weekend?!? !